Two months ago, 300 people, most of them children, were killed when militants demanding independence for Chechnya seized School Number One in Beslan. Jonathan Charles covered the siege and has now returned to see how the local people are coping. Sometimes it is good to go back. Returning to Beslan felt like the right thing to do, a chance to put the terrible events that I had witnessed on that early September day in to some sort of context. During more than 16 years as a BBC foreign correspondent, I have covered conflict after conflict, catastrophe after catastrophe. I thought that I had seen death in all of its possible forms but the ending of the school siege in Beslan, in which hundreds of children and adults died amid a cacophony of gunfire and explosions, had burned disturbing images in to my mind - images which were proving hard to shake-off. I kept recalling the exact moment when grief overwhelmed countless families. The father of one of the hostages was standing close to me as the siege reached its violent conclusion. When the shooting began, his hands covered his face in horror, tears flowing from his eyes. Like all of us, he could imagine what might be happening to the children who were trapped inside the school. Even as bullets flew towards us and we all ducked for cover, during the pitch battle between the Russian security forces and the militants his suffering was impossible to ignore. The sight of this parent enduring such pain has rarely been out of my thoughts. I have been sent on enough courses about post-traumatic stress, in recent years, to know that it is dangerous to suppress the emotions that had been unleashed. At their worst, they can trigger severe depression. In the macho world of the foreign correspondent, it is not fashionable to admit that you have been scarred by what you have witnessed but sometimes it is impossible to be just a detached observer. So I was going back to film a report about how the town was coping with its trauma and to look at how music was being used to aid the healing process. But I was honest enough with myself to acknowledge that was just a smokescreen. I had not suffered anything like the agony of the grieving Beslan families but I needed to replace my persistent mental image of Beslan's torment with something more positive. Wandering around the town, more than two months on, there are signs that people are beginning to realise that life must go on - trying to lance the boil that is their collective trauma. At a counselling centre, I watched as a group of children took part in a music therapy class. Among those running around the room, to the accompaniment of an out-of-tune piano, were two brothers. Four-year-old David and six-year-old Georgy saw their father hauled away by the militants and shot dead, just hours after the start of the school siege. Their mother, Zeta, who was also a hostage, sat watching the class - weeping. The music therapy is supposed to relax the children, encouraging them to communicate their feelings. Zeta told us that her children can think of nothing else but the death of their father. She said at the moment when the siege ended, six-year-old Georgy started singing all the songs that he knew and reciting poetry. Somehow he blocked out the battle going on around him by concentrating on his singing. Now music is part of his treatment and it is allowing both David and Georgy, two sweet little boys with sad eyes, to smile for the first time in weeks. There were smiles, too, when I arrived at the region's most prestigious music school. The head teacher, Zhanna Tsutseva, says there is a new focus on children and their education since the horror of Beslan. She took me to see one of her pupils practicing. Twelve-year-old Anna, a serious looking girl with long dark hair, was playing Rachmaninov on a battered piano - a passionate, moving performance. The music school has been starved of money by the state since the collapse of communism more than a decade ago but now there is hope that could be remedied. Charity donations are flooding in to the area, including money raised by Russia's famous Mariinsky orchestra which has been playing special fund-raising concerts in London and other European capitals. It is all part of a renewed effort to invest in children and to make sure they develop fully in this poverty stricken part of Russia. As we listened to the Rachmaninov concerto, it seemed that Beslan was also trying to turn its trauma in to something more positive. One man summed up how life has changed. 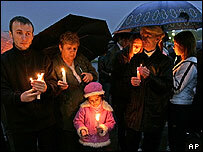 He said "We didn't treat our children very well here before Beslan. Men in particular often behaved harshly towards their sons and daughters, but now they're treated like Gods". He is just one of many people here attempting to make sense of a senseless slaughter, wanting to discover their own small message of hope. From Our Own Correspondent was broadcast on Saturday, 13 November 2004 at 1130 GMT on BBC Radio 4. Please check the programme schedules for World Service transmission times. Beslan: A Concert for the Future, a fund raising event by the Mariinsky orchestra which includes a film by Jonathan Charles on music therapy in Beslan was broadcast in the UK on Saturday, 13, November 2004 at 1925 GMT on BBC Two.